The Merseysider has been forced to shed a stone for a cruiserweight clash with undisputed champion Usyk at Manchester Arena on Saturday night, live on Sky Sports Box Office. Bellew did not need a bodybuilder physique to inflict two defeats on David Haye, but can he compete with the athleticism of Usyk? If he turned up shredded for the fight, I would think that something was wrong, to be honest. It depends on the individual. Everyone is structured differently. Tony Bellew has never been one, even when he was at light-heavyweight, to be shredded. He's just not that type of body shape. If he turned up shredded for the fight, I would think that something was wrong, to be honest. He needs to focus on what makes him effective. He's got more of a smooth body shape, similar to Bernard Hopkins. Muhammad Ali was never shredded, but he goes down as one of the greatest heavyweights of all time, same as George Foreman, Joe Frazier. None of these guys were shredded, but they were all amazing fighters. And that's it. It's not a bodybuilding competition, it's a boxing match. I was quite physically chiselled and I had a good athletic physique, but you've got top fighters who look quite smooth, with a bit of a layer on them. It doesn't make any difference at all. It's a boxing match, not an aesthetic fitness competition. It's all about being able to fight, and Bellew can bloody fight, believe you me. Bellew won't be ripped but he doesn't need to be. They will be the same weight, and all Tony had to do to get back down to cruiserweight was diet. It needs discipline and it doesn't mean he will have new muscles we've never seen before. We know Bellew has power and this isn't about muscle, it's about fitness and skill. He will feel comfortable and still feel strong. 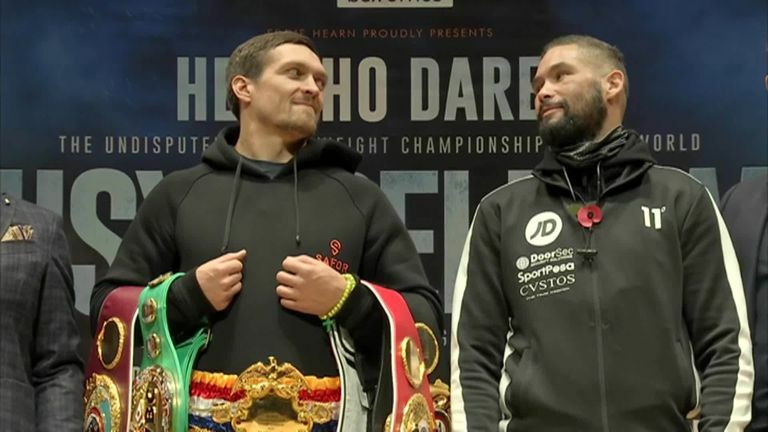 It might surprise Usyk at the weigh-in, but he will have seen Bellew fight before. We know Bellew has power and this isn't about muscle, it's about fitness and skill. It's all about body type and Bellew has never had that physique. Even when he was down at light-heavyweight he was never ripped or cut, and he was weakened and stripped right back to get down to that weight. Bellew has always been fat. I would be worried if I saw him looking any different. Muscles mass doesn't matter at all. Muscles hold oxygen and muscles can slow boxers down in the later rounds. If you look at some of the great fighters in my weight division, Marco Antonio Barrera and Erik Morales, they both had bodies like Bellew. Tony has always had that fitness to carry him through 12 rounds, he's always been in brilliant condition, and he looks phenomenal for this one. He's in the best condition I have seen him.